Our Energy Future is full of tips about reducing energy use at home and hands-on activities. Learn about alternative energy sources, the rooftop solar array that powers part of the Museum and more. Bring the entire family to experience this fun and engaging exhibit. 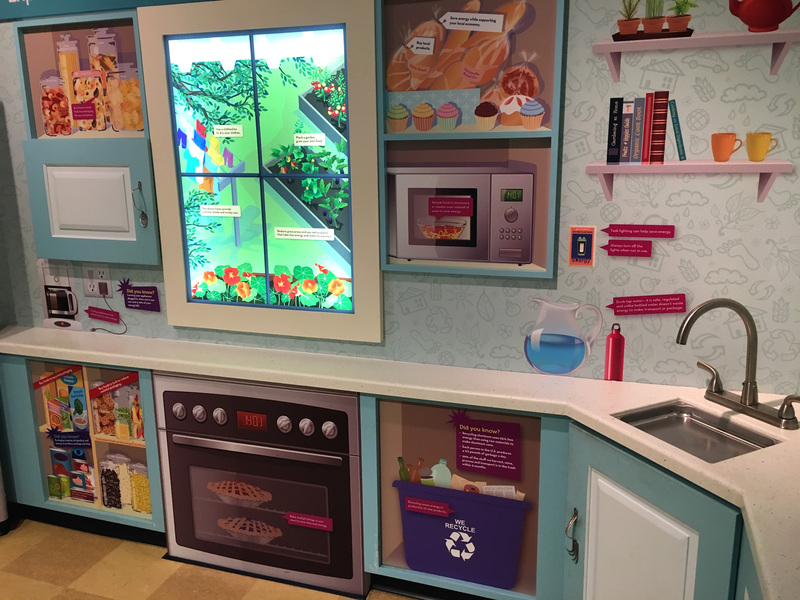 Explore the exhibit to learn what steps you can take to conserve household energy usage. Find out how to conserve energy and save money at home, and see how your home energy use compares to your neighbors. 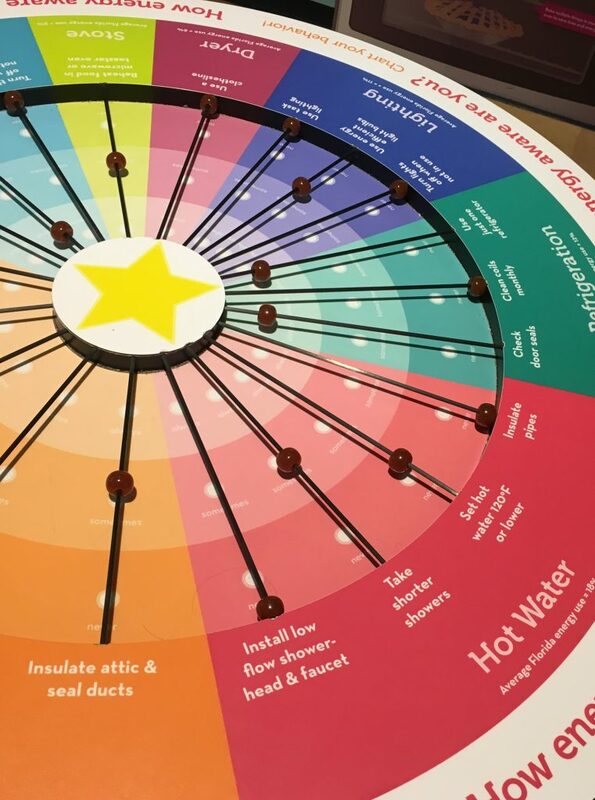 This giant chart reveals the top eight uses of energy in a typical home in North Central Florida. Rate yourself using the abacus and discover where you can reduce your energy consumption. With the touch of a finger, explore ways to conserve energy and save money at home using a computer interactive. Learn how your home energy use compares to your neighbors’, check out what area residents are doing to save energy and make a commitment to lower your energy use. You can save energy and money by using efficient lighting. Discover the best and most energy efficient ways to light your home through this interactive component. Did you know if you plug appliances into a power strip and turn it off when not in use, you can save 5-10 percent on your electric bill? Find out what other steps you can take to conserve energy. Take a close-up look at photovoltaic solar panels like those used on homes, businesses and other structures. Did you know heating and cooling use about 35 percent of household energy? 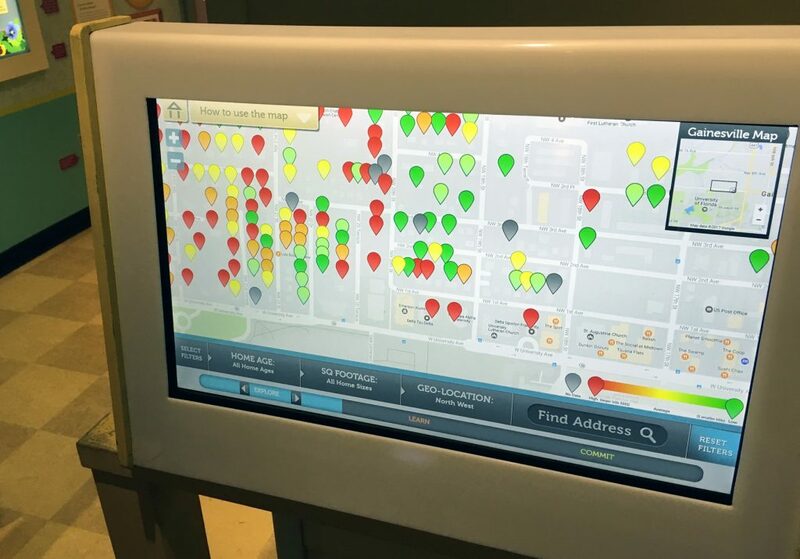 Learn more about energy use through this touchscreen interactive. In 2010 the University of Florida installed a 75 kW solar array on the Museum’s roof. The system produces about 8 percent of the power consumed by the Museum. The U.S. ranks first in the world for energy consumption per capita. Americans use 8.35 tons of oil equivalent, the amount of energy released by burning 1 ton of oil, per person. In Florida, most energy is used for air-conditioning in summer and heating in winter. Homes in Florida use 6 percent of the electricity produced in the U.S. Most electronics draw power even when “off.” The biggest offenders are TVs, DVRs, cable/satellite boxes and laptop computers. Adjusting your thermostat one degree higher in the summer and lower in the winter may reduce energy cost by 4 percent. Making cans from recycled aluminum uses 95 percent less energy than using raw materials. Each person in the U.S. produces 4½ pounds of garbage a day. Within six months, 99 percent of the items we harvest, mine, process and transport are thrown away.